Just like last year, the Tngnt Carve Skibike is a full suspension bike that will give you great performance out of the box! It comes standard with awesome components that allow for an amazing experience on the slopes. One of the best assets of this bike is its price point and its ability to customize it to make it your own. It’s a slick Skibike for the rider who wants to have a solid set of components from the start but may also want to do some upgrading as their riding style develops. Things that can be upgrade are, front fork, rear shocks, handlebars, seat setup, and Tngnts patented ski retention inserts to control ski responsiveness. 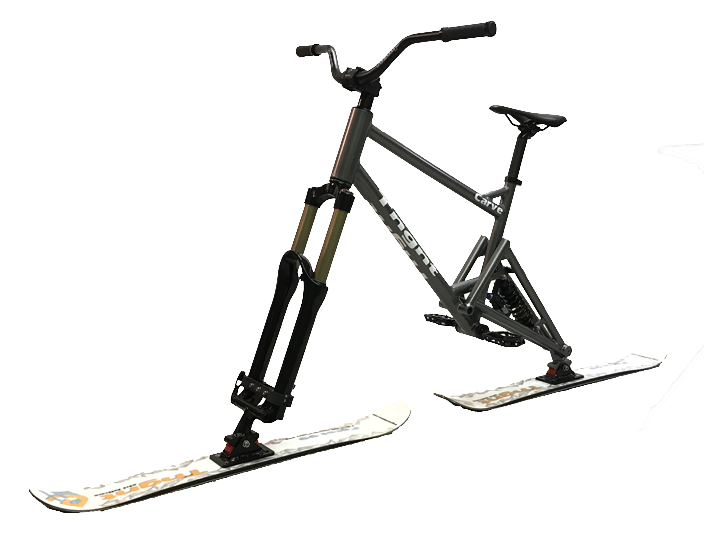 Another thing that makes Tngnt unique to the rest of the Skibike market is their patented Ski Retention System. This is the connection point between the fork/frame and the skis. Every skibike company has a different way of connecting their skis to their bikes and a system of controlling the stiffness of that connection. Changing the amount stiffness will change the feel of the skibike in different ways. The Tngnt system allows you to use different inserts to change the stiffness depending on the riding style you like. It’s a clean, refined system that we really enjoy and we think you will too! This year upgrades include updated reinforcements in the rear fork as well as a front fork suspension upgrade. That’s right, for the same price as last year, this year’s bike now comes with Marzocchi 350 R from fork for even better performance on the mountain! Headset: Tapered Headset – top cup = ZS49/28.6? bottom cup = EC49/40? Stem: BMX style – 50mm, 22.2 diameter, 1 1/8?